With a suggested selling price of £322 in store it's dangerously close to being a real game-changer. A sound that comes in way above its price point. Jumping up very nearly 150 notes from the recently-reviewed 800M, the FG830's increased price tag is certainly reflected in its looks - it's a much more classy proposition with its thinly gloss-finished body, deep chocolate coloration of the rosewood laminate back and sides, and satin neck (though less 'open pore' in feel than the FG800M), all topped off with old- looking, cream-coloured edge binding. There's a little abalone bling in the soundhole décor and headstock motifs, too. Like the FG800M it's near-perfect in execution - inside and out - and if asked the retail price, we'd undoubtedly suggest a substantially higher figure... and that's before we play a note. Perceived thought says that solid rosewood back and sides, compared to mahogany, should create a little more definition sound-wise and although the laminate construction here will narrow the differences, we certainly hear some of that: there's more sparkle added over the roomy dreadnought character of the FG800M. That smoother neck finish does tell your hand it's a more upmarket proposition even though the shaping is near-identical and again comparing the FG830 with a much more expensive USA solid wood spruce/rosewood dread (a new Taylor 410) we're hearing a guitar that on all levels, not least sound, punches way above its price. 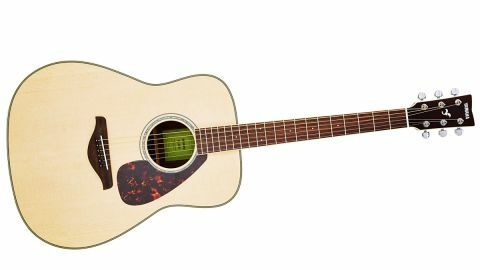 Okay, we don't get a case or gigbag in the deal and the cutaway electro 'X' versions ramp up the price to £536 but as a pure acoustic dreadnought this is one you simply must try whether you're just starting out or are a lot more experienced.